How do you know if you’re going to make it as a freelancer? I’ve been freelancing for eight and a half years now, and to be honest, there were times early on where I thought maybe I wasn’t cut out for it! Assuming you really want to succeed as a freelancer, though, what qualities do you need … and how can you develop them? I’ll go through the four that I think are most essential, but I’d love to hear your take in the comments! This might seem like an odd quality to put first – surely writing ability matters more? Without self-confidence, though, it’s very tough to get anywhere as a writer … especially as a freelancer, where you need to be consistently producing work that’s going out there into the world. When you freelance, you need to be able to tell yourself “my writing is good enough to charge for”. That can be difficult to believe for all of us at times (I certainly have my own moments of doubt!) but if you really struggle to believe it, you’re going to find it difficult to market yourself and get clients. Please don’t worry that feeling unconfident means you’re probably not much good at writing. I’ve coached dozens of writers over the years, and read the work of many more. Plenty of very good writers feel an extreme lack of confidence … and plenty of mediocre writers are filled with confidence! The tricky thing about self-confidence is that the best way to develop more of it is to take the scary step of putting your work out there. By getting some of your writing published and read. The easiest, quickest avenue I’ve found for this is to write guest posts for large blogs: many don’t pay, but you will get the experience of writing for a large audience – and the confidence-boost of knowing someone thought your work was good enough to publish. By getting paid for some of your writing. This is always reassuring and a confidence boost, and it can help validate your writing in the eyes of friends and family. Most of my early paid writing was for blogs, but I also wrote the occasional filler article and letters to magazines. As you get further with your writing career, hang onto any nice emails, testimonials, reviews, and so on. I’ve been going through a bit of a crisis of confidence with my fiction writing recently, and it’s been really encouraging to look back over some of my novels’ reviews on Amazon. As a freelancer, you need to be able to write fluently in your chosen language. (For most Aliventures readers, that’ll be English.) 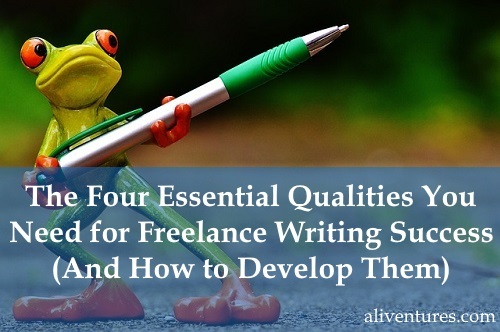 Note that’s fluently, not brilliantly – some freelancers have a tendency to aim way too high! It obviously helps here if your chosen freelancing language is one you grew up speaking and writing, rather than one you’ve learnt later in life – though of course many people can and do become fluent in a second language. If you’re a non-native speaker, Carol Tice has some excellent, plainly spoken, thoughts here: An Open Letter to ESL Writers. If you’re not sure whether your writing is fluent enough to freelance, it’s worth writing a couple of guest posts to see whether you can get them published, or asking some honest friends for feedback. But if you’re a native speaker with some level of writing background (e.g. you studied English Literature at school, you do a fair amount of writing in your day job, you’ve been writing poetry for years) then you probably are perfectly good enough already! Get as much practice as you can. Deliberately work on things that you know you struggle if: for instance, if you can write lovely sentences but find structure difficult, you might write bullet-point plans for several potential articles or blog posts. Get feedback from other writers, or from editors. Often, you can do this in a peer-to-peer way, perhaps partnering up with another freelancer who you’ve met locally or online. You could also pay for help from an editor, asking them to review your work and make suggestions for improving it. Of course, there are plenty of great books, courses and blogs about writing that can all help you develop your skills. Do feel free to use these, but make sure you’re not spending all your time reading about writing without actually writing! The best way to learn is to put what you’re learning into practice. One struggle that many freelancers face – and many would-be freelancers worry about – is how to stay focused when you’re working on your own. This is one area which can divide “good freelancers” from “good employees”. Some people (me included!) like to have a lot of control over their time and tasks; others much prefer to have a list of tasks given to them, or a clear timetable structuring what they should be doing when. As a freelancer, you need to be able to work well without oversight: if the only thing that stops you spending all day on Facebook at your day job is the fact that your boss can see your computer screen, you may find freelancing a struggle. Most freelancers find procrastination at least a little bit of a problem: it can be particularly tricky if you don’t have clearly defined working hours (so you end up wasting time during the day then working every evening) or if a lot of your tasks can rather easily shade into distraction (e.g. you use Facebook to market yourself but also to keep in touch with friends). Firstly, please don’t blame yourself if you struggle to focus sometimes (or most of the time). Try not to see this as an issue to solve with gritted teeth and the application of lots of willpower; instead, it’s something that’s best helped by tweaks to your working environment. Use apps to block distracting websites. If you spend a little too much time on Buzzfeed, or if you find yourself checking Facebook every ten minutes, simply block the websites. There are plenty of apps that can do this: I like Focus for Chrome. Turn off your internet connection altogether (or go somewhere disconnected). I’m writing this post in our local library, where the wifi is slow and my laptop can’t reliably keep a signal anyway! I get some of my most focused writing done here. As a freelance writer, you need to be able to communicate clearly with clients. I know that sounds pretty basic … but it can be a real source of difficulty for some freelancers. Getting your message across clearly and unambiguously. This might mean being more assertive than you’re naturally comfortable with. It may also mean using specific writing techniques; e.g. having numbered bullet points to set out a list of requirements clearly, rather than putting everything in one big paragraph. Being willing to adapt your communication style for different clients, according to their preferences. That might mean sending detailed emails to one client, and brief emails to another – backed up by phone calls where necessary. Setting boundaries about when and how communication will take place between you and your client. For instance, you might tell them that you only take calls during certain hours, or that you’re always happy to talk on the phone, but only by pre-arrangement. You might state that you don’t check or answer emails at weekends. This is one area where I think reading blog posts or a good book can help a lot, as it may bring up things you’ve never thought about before. I’d recommend Pace and Kyeli Smith’s book The Usual Error as a good place to begin. Michael Hyatt has an excellent post on communicating well by email here. Notice and review times when communication has gone a bit awry. For instance, perhaps things would have gone better with your last “difficult” client if you’d set out clear expectations from the start about how and when you could be contacted. Use diary or task management software to remind you to communicate regularly with clients. This can be helpful on longer projects, where clients may want an occasional update to let them know all is going smoothly. It can also be important for keeping in touch with clients who have semi-regular work for you. Develop specific processes for different parts of your work. For instance, if taking on a new client is always a stressful mess where you end up having to continually email them to check about just one more thing, then develop a checklist or questionnaire to use with them from the start. Michelle Nickolaisen’s book Rock the System: Using Systems to Grow Your Business With Less Pain + More Fun (Amazon.com / Amazon.co.uk) is a helpful one here. I love freelancing. But it’s not for everyone – and that’s fine. If you are keen to freelance, though, and you know you need to develop some of the above qualities, that’s not a problem: just deliberately work on them. They may not all come naturally to you, but that definitely doesn’t mean they’re impossible. Want to get off to a good start … and take your freelancing further? Check out my post Freelance Writing: Ten Steps, Tons of Resources. I agree. I see kids these days, all wanting to freelancer without having the necessary knowledge and determination to be one. They think that just because some have done a good job of it, and then they’ll pretty much end up with the same fate, but actually, you need to really build in your hours if you want to make it far. Your right. One really needs to have focus in being a freelancer. The thing is when you’re only working from home, you tend to become distracted. Good points you have here. I’ll be sharing this on social media. This article is very helpful in my current situation as I am a newbie blogger (blog just launched a week ago) and aspiring freelance writer. I want to use my blog as sort of resume of my writing, as a way to develop my writing and to help others with a topic I am passionate about.